Oil prices continue in the $70s, excess crude inventory has been eliminated, supply constraints loom – but upstream investment remains soft. Despite the reviving crude market, many operators are not yet increasing their spending on capital projects -- though even in this soft environment several production floater contracts moved forward over the past month. SBM received a FEED contract for the Liza 2 project that will morph into an EPC contract. Mitsui OSK entered into a preliminary agreement to develop and operate an FSRU regas terminal in Hong Kong. TechnipFMC/Samsung and Modec were awarded competing FEED contracts for the Caldita/Barossa FPSO. All is discussed in WER's July report. 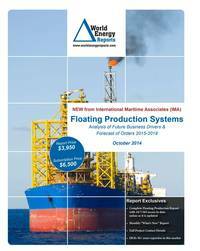 Also in the data section of the report are details for 229 floater projects in the planning stage, 50 production or storage floaters now on order, 300 floating production units currently in service and 29 production floaters available for redeployment contracts. Charts in the report update the location where floating production and storage systems are being planned, operating, being built and to be installed. Accompanying excel spreadsheets provide the report data in sortable format. Information is current as of 23 July.